MetroCONNECT MC12000 presents a centralised platform for Carrier Ethernet Service Delivery, offering sophisticated management, high port density and enabling the efficient use of core network infrastructure. 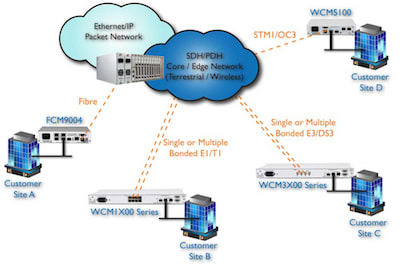 The MetroCONNECT MC12000 offers a high density flexible Ethernet Service Delivery solution with fibre or copper distribution from the core network to customer sites. 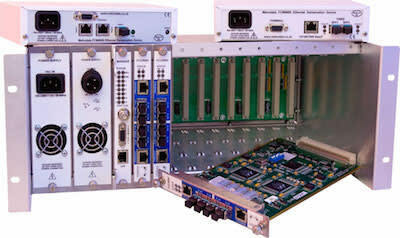 Various I/O modules can be used to deliver Ethernet services over a wide variety of last mile services to matching standalone devices performing managed LAN extension or managed media conversion functions. Support for 10M, 100M and Gigabit Ethernet applications as well as Jumbo frames comes as standard across this product range. Comprehensive end-to-end management is supported using 802.3ah or IP, offering visibility right up to the customer demarcation point. The MC12000 is a 4U, 19 inch rack based chassis unit supporting up to 2 power supply modules (PSUs) and 12 I/O modules supporting up to 48 services. Spare I/O modules can be resident in the chassis ready for the immediate deployment of additional capacity or to provide “in situ” spares. The “hot swap” capability of I/O modules and power supplies eases the provisioning of new services and the maintenance of existing services. With multiple access links deployed, resilience can be supported using G.7042 LCAS and/or RSTP. Each WCC1400 I/O module can support 4 standalone WCM1100 or WCM1101 units deployed at different customer sites to deliver 4 separate 10/100/1000BaseT or fibre Ethernet services over fractional E1 or T1 circuits, with up to 48 individual Ethernet services being delivered via a single MC12000 chassis. The MC12000 only requires a single PSU to support a full compliment of I/O modules, but for increased resiliency redundant PSUs can be used. The PSUs are load sharing when used in the optional 1+1 redundant configuration. For maximum MTBF (mean time between failures) the -48V DC PSU modules may be used.Typical operating power consumption is less than 75 watts. The MC12000 system management module manages each of the I/O modules and has the ability to extend management to remote demarcation devices and beyond, via IP or OAM messages with separation using VLANs. The I/O modules optionally generate and terminate OAM frames according to IEEE 802.3ah. Each I/O module supports standalone operation with defaults configured using simple bit switches for ease of installation, which can then be overridden by the management software. Management of the MC12000 is either via the console port, or the management Ethernet port using SNMP, Telnet or a Web browser. SNMP traps are generated based on I/O module alarms which can be individually enabled. TFTP download of software and configuration is also supported. To further future proof the MC12000 system, remote hardware upgrade of CPLD firmware is possible. Management access has password protection whether via the console, Telnet or browser interface. Performance statistics are available for all ports with data collection in 15 minute segments for a 24 hour period. For security, the MC12000 supports SSH and TACACS+ for access control. Whilst the MetroCONNECT product range uses industry standard user exchangeable SFPs, it is recommended that these are purchased from Metrodata to guarantee their specification and compatibility with each other. 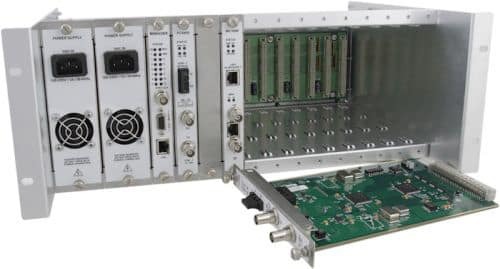 This application shows how a MetroCONNECT MC12000 chassis with a variety of I/O modules fitted can deliver Ethernet services over a wide range of last mile services. The MetroCONNECT solution offers interface conversion or LAN extension as well as Ethernet service demarcation, with comprehensive remote management of the standalone Ethernet Demarcation Devices (or EDD's, otherwise known as Network Interface Devices or NID's) on the customer site using 802.3ah OAM or IP management. Support for 10M, 100M and Gigabit Ethernet applications as well as Jumbo frames comes as standard across this product range. The following specifications relate to the MC12000 Chassis without any interface modules fitted. Each individual module also has its own specifications, check each module for further information. If you require another SFP or user I/O module or one currently under development please contact our sales team with your requirements who will be happy to help.